…shame about the picture though. I chose Precision – Party Like a Rockstar for the gold under-layer because of it’s hawt metallic qualities. 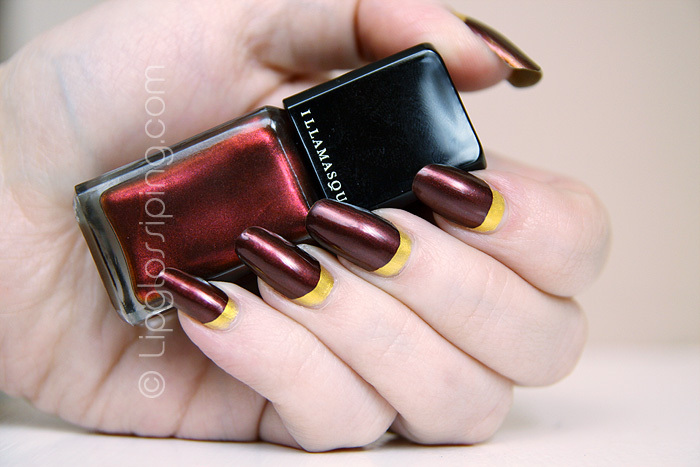 Over the top, I added Illamasqua Scarab to create a nice, Wintery feeling manicure. Unfortunately, the flash firing in the photos simply shows Party Like a Rockstar as a solid yellow and not the beautiful metallic gold that it is in reality. I was a lot easier to achieve that I thought it would be… a little bit of patience is honestly all that’s needed. For a great how-to on the Ruffian inspired manicure, check out one of my favourite nail blogs Lacquerized. I can’t even tell you how many people admired my nails yesterday… oh ok, about 9 separate people and they ALL wanted to give it a go for themselves once I explained how it was achieved. Have you attempted Ruffian Nails yet? Which colours do you think would work best together? Why are they called Ruffian? I like the look though, it looks difficult to achieve, I’ll try it when I get around to sorting my nails out. Ruffian because CND (Creative Nail Design) created the design for the Ruffian show at NYFW this year. I haven’t tried this yet, but it looks really cool. I’d like to combine a gray and a midnight blue. What do you think? I think that would work really well! Your nails look really good especially for a first attempt and the cold polish looks great. Im really bad at any nail art. Oh I really like the colors you chose! Why is this called Ruffian? Ruffian because CND (Creative Nail Design) did the design for the Ruffian show at NYFW this year. Absolutely gorgeous, I’m in love with this! I love this look! I bet you can recreate that with other complimentary lacquers. Job well done. CBeauty..
You sure can, the possibilities are almost infiniite! Oh, it’s like the opposite of a french tip Will try this soon! Not shabby at all! I can imagine what it looks like, bet it looks amazing in real life! Great combination, now if I had Scarab, like, yesterday…*sigh*! (Ok, that sounds too weird to any non-makeup fanatic, haha)!